Training started Friday and what do you know? 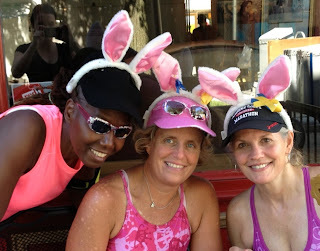 Energizer Bunny DID stay strong for her long run - she can glow! 84 miles on the bike? We'll shout from the rafters! Doing the loop a second time made it easier we did learn! As soon as we were done did a super short brick. Out and back to the car we made it quick! She was lucky with no rain as well as little sun! 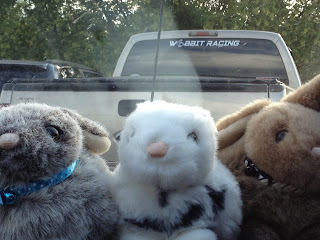 Energizer Bunny did float down the river with some friends! The time passed very quick and that came to an end. She kicked back in an awesome chair – she’s no fool! We cheered our friends streaming live across the IMLP finish line!! Less than six weeks until Ironman Wisconsin time! Happy to feel "cooler"? Oh boy, howdy!! Just 30 miles - that's the scoop! Then what do you know? We changed shoes! Gotta get our legs IM Moo race ready! Our foursome had planned this so we weren't surly! Two out and backs made it dreamy. All done before the day got steamy! It was like bath water - not cool! Anyone hankering for a Slurpee, perhaps? 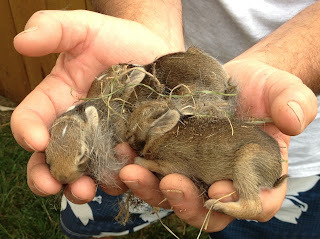 What do you know - baby bunnies in a planter! Guess who made the IMTX 2013 highlight video? What's Up, Doc?! That's who!! Hit the road to Wisconsin for a lot of swim bike run! A man wearing a bike helmet and driving his car? Salads at Subway at the Happy-Happy, Pain-Pain site! Come up with a song with every state's name! We went a third of the way so for the night we could stop. The GPS messed up and we ended up in a scary corn crop! And made it to the hotel without a doubt! To our final destination – Madison! Same Wendy's from three years ago, you don't say? Finally made it into town and unloaded our stuff. Then tried to get dinner but it was kind of tough! But we waited it out for food, don't you know? Four gallons of water should be no surprise!! Back to the hotel and straight to bed! Getting rest so our legs aren't like lead!! Next morning to Lake Monona for a practice swim. Took a group photo with the girls on a whim!! T’was a little choppy but we made it through! Out of the water and onto the shore. Time to change and get our bikes for a little more! Met in Verona at the Rocket Bicycle Studio shop. Where we got cool orange bracelets and a pre ride pep talk! So wheels up -- we are on our way! It sure is another beautiful day!! Team Rabbit headed out for the first loop of two. There were 4 major climbs we would have to get through! Mount Horeb and 3 witches -- spelled with a "B"!! And we would have to go up them twice you see! Energizer Bunny saw a farmer who was hot! Should she stop and say hello? I think not! The color is unnatural and almost looks fake! Felt like we were riding in one from the olden days! Rolled back up to our car on the street! Then it's official -- our training day is done! Our rabbit tops and positive attitude picked her up when she was low! We'll be riding it on race day -- that's the fact, Jack! The water was great and felt really cool! We headed to Ian's Pizza for salad and a slice! In the am we run on the actual course- isn't that neat! Beautiful day for a run- aren't we blessed! By Carting around some water along the way! Didn't matter because our way was still a pill! One bunny got a Slurpee and it was heaven!! Some people saw us and asked if we lost a bet! No we haven't -- at least not yet! 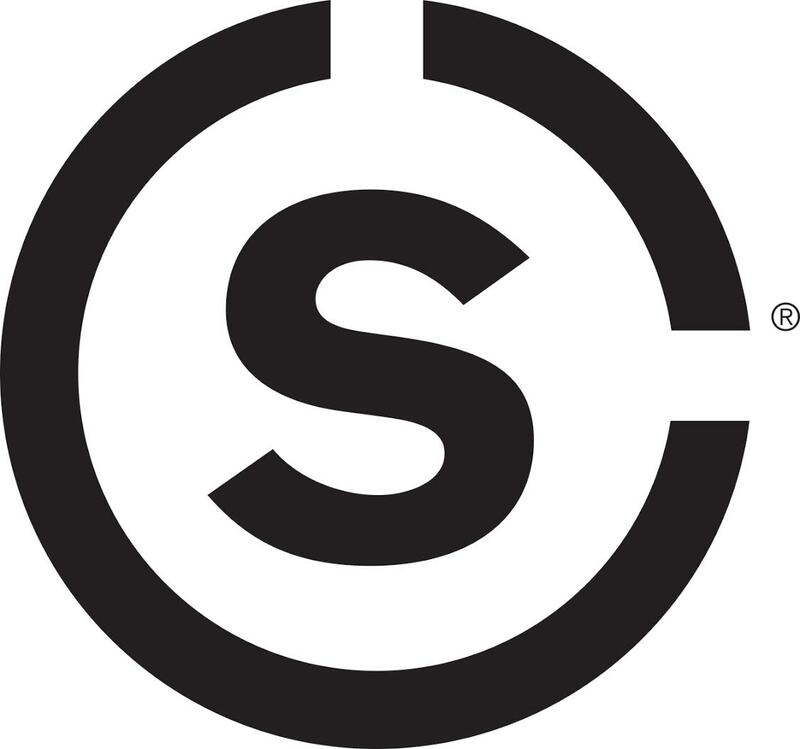 You can find us on Facebook or the Twitter stream! Dodging peeps at the art festival sure was fun! Time to do burpees just four and no more! Finished up then said 'hi' to Rob from EVOTRI. Thanked him for the weekend and then we said 'goodbye'! We did not lose a bet! Did we get comments on our ears? You bet -- a bunch!! Then back to the hotel where we cleaned up. Next it was time to pack up the truck. Her journey home would be kind of short! 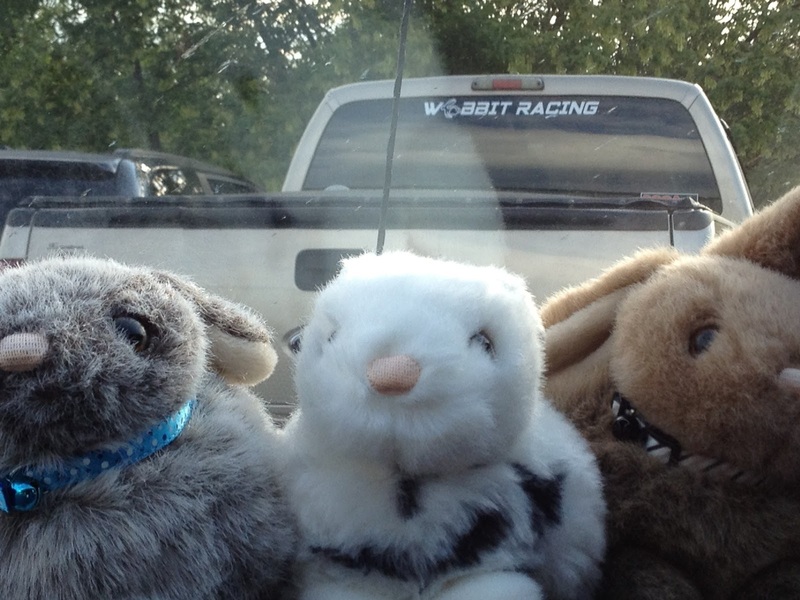 Energizer Bunny and Silly Rabbit were in it for the long haul. Stopped for the night near an Indiana outlet mall! They had to go on their way hippitty-hop! So the WIBA weekend had come to an end. We bid goodbye to all of our friends! Made our time in Madison so very well spent! Definitely got some good training done. In Rabbit style we had a lot of fun! They had a 50/3 brick to do you see! We completed that and then we ran! And they were on bikes - oh what a sight! The main challenges were the bugs and the heat. But we did our burpees and cartwheels - isn't that neat?! Next day Silly Rabbit had planned another brick! Less than 24 hours after the other - isn't that sick? For 27/4 her legs would cooperate. Over 2.4 miles Doc and Silly got much tanner! To Madison, Wisconsin and the training plate will be full! The WIBA weekend is finally here! 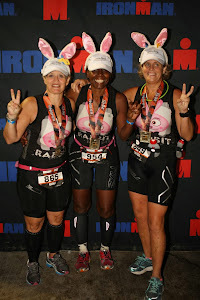 Team Rabbit will get in swim-bike-run gear!! The Kick AST Sprint Tri can't be beat! But if you went short you wouldn't be a cheater! Off we went in our bikes in a flurry! We put on our ears and peeps thought that was cool! Since it was hot out that made our day! Then we were done and it was time for food. All 16 racers were in a good mood! It was body glad when we went on the ride! Rabbittears Patti and Joyce came out to play!! Thanks to our hosts, Mike and Joe. You guys know how to put on a show! This event is a great tradition for the Fourth of July. Happy Independence Day and nice job on that Tri!!! 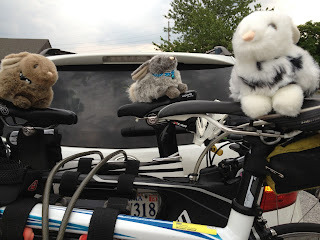 Silly Rabbit and What's Up Doc did a 48 miler out of Harwood. Neither they or their friends got wet and that was SO good! Lots of motorcycles and puddles they did dodge. And hopefully no gravel in their bike shorts did lodge! As I'm sure she would have found all the rubble very funny!! But not for too long - for that would be crazy! She did get in the water and even walked a bit. When it was all said and done she had to remove a tick! 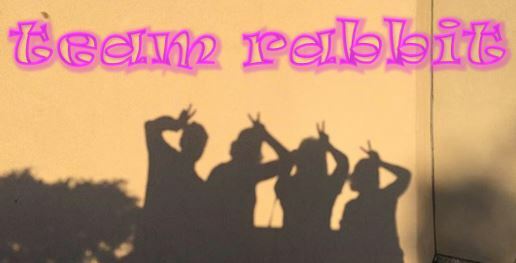 But in just 10 days Team Rabbit will take a trip. Off to Madison to bike and run; we'll even take a dip! !